In Mercedes-Benz’s infinite wisdom, they decided to make a critical safety component out of bare metal and left it exposed to the elements. Well it took 155k miles but my 2012 finally succumbed to the infamous reluctor ring corrosion. I actually found a 21st century way to check smart rings, but more on that later. When the ABS system fails you lose all active safety features. You don’t have traction control, stability control, ABS, hill start assist, or the transmission creep mode. While the more “raw” driving experience is fun and I adore the death of creep mode, it’s frankly irresponsible to leave the car in this condition when I drive it like I do, so off to figuring out what exactly happened! Evilution (an encyclopaedia on smart repair) recommends putting the car into Neutral, putting it up on stands/jacks, then rotating the rear wheels while you stick your head into the wheel arch to look at the rings. While this does work, it’s a very sketchy task to do in the winter and without ample tools to save the car from crushing you. An easier and safer way to check your rings is to take a smartphone with a LED flash, open your camera app, switch it to video, turn on the LED, then stick it into the wheel wells right above the tyres. Granted, you may not find the crack this way, but you will be able to see just how corroded your rings are. If you have a second person on hand you can have them slowly move the car while you film the rings? Anyway, my rings don’t look so hot. They’re heavily corroded, somehow there appears to be some scoring, and spacing between each tooth doesn’t appear to be equal. This alone is enough to piss off ABS, but there’s also likely a crack somewhere, too. I actually got lucky considering that a lot of reluctor ring failures have been known to happen long before even 50k miles, let alone 155k. How do you replace the rings? Happy you asked! Remove the rear axles then tug on the rings, depending on how corroded they are they’ll just crumble and fall to the ground. 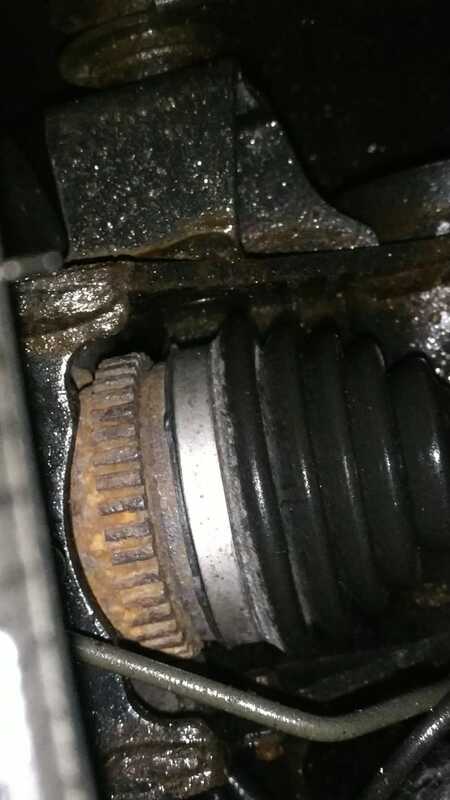 Then you take a new ring (preferably not an OEM one, but one of the galvanized and painted aftermarket ones), wire brush away the surface rust on the axle, then slide on the new ring. Button up the axles and enjoy a working ABS that should now last the rest of the life of the car. *Sigh* Who even signed off on this? It was a rampant issue in the first gens so they just decided to change absolutely nothing in the second gens? At least the aftermarket did what MB failed to do.